If you are looking for information on the Which Wich Superior Sandwiches franchise business opportunity, Which Wich franchises or Which Wich Sandwich franchising, then you have come to the right place. Which Wich is an innovative yet simple sandwich concept that focuses on the "wich" -- a toasted hot sandwich available in over 40 varieties. We are strategically positioned in the fast casual sector, the fastest growing segment of the restaurant industry. Our system is a success because of our singular focus on wiches (plus the accompanying chips, drinks, and cookies). By design, we have eliminated most of the moving parts in typical restaurants, which saves on space, storage, training, food costs, etc. This unique system creates maximum efficiency, which is duplicated in every Which Wich. Why are they called "SUPERIOR SANDWICHES"? Which Wich's customer-interactive ordering system allows customers to design their wiches exactly the way they want them. Each wich starts with great bread and only the finest and freshest ingredients are added. Our highly-trained staff is dedicated to achieving 100% customer satisfaction. The end result is superior sandwiches and a dining experience that customers can't get enough of. 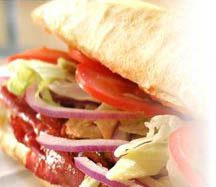 Which Wich was developed to fill the huge demand for a fresh concept of superior hot sandwiches. This type of concept - offering an exceptional product in an exciting atmosphere - was long over-due.